Bester Glandson, a smallholder farmer in Malawi. Smallholder farmers in low-income contexts face a variety of challenges while attempting to boost their productivity so as to escape subsistence-level farming and poverty. One of these is access to affordable key agricultural inputs (seeds and fertilizer) in a timely fashion. This access, unfortunately, is often the exception rather than the norm which then leads to a particularly acute problem in the fertilizer sector, where the application of the wrong fertilizer to crops or late application can result in diminished yields and reduced productivity; dragging smallholder rural farmers further into the negative cycle of poverty and diminished economic opportunity. Sustainable Development Goal(SDG) target 2.3 strives to, “double agricultural productivity and incomes of small-scale food producers…through secure and equal access to land, other productive resources and inputs [e.g. fertilizer] …”. 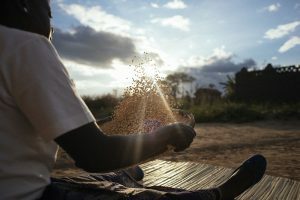 The FAO estimates that 75% of the necessary increase in regional food production must come from intensive production, and the use of inorganic fertilizer is generally considered one of the primary means to realize short and medium-term agricultural productivity increases through intensification. Unfortunately, actionable data on fertilizer usage and supply is notoriously poor in a majority of low-income contexts, thus constraining the potential of countries to make progress in ensuring smallholder farmers have the right quantities of fertilizer at the right time. This may be why, despite efforts through extension services to stimulate usage of inorganic fertilizer amongst smallholder farmers, productivity remains stubbornly stagnant. Fertilizer is only effective when applied to the right crop, in the right amounts during the right time in the cycle which is not usually the case because of the local markets’ inability to serve farmers at the right time. This can be due to poor market linkages, infrastructure challenges or poor/non-existent data on farmer needs and preferences. The data and information on fertilizer availability, price and application is not just necessary for formulating evidence-informed policy interventions. It is also necessary for decision making at the farm level. For instance, smallholder farmers have historically relied on physical visits to fertilizer shops as a way to obtain information on availability, prices and suitability. It is also important for supply side actors such as local fertilizer vendors in getting their jobs done. It is not unusual for local vendors to sometimes be caught unawares by an increased or decreased demand for fertilizer because they lack some of the data that could signal changes in demand in addition, to traditionally available information related to weather and crop calendars. These asymmetries can result in late application, no application or application of the wrong fertilizer type as smallholder farmers can feel pressured to settle for whatever is available due to the fear of delay in planting of crops. These problems can be addressed by making data available to farmers and vendors that can support the decision making process. While farmers and vendors already make sophisticated final planning decisions related to timing of purchases, they are forced to do so based on anecdotal or historical data. Providing them with better and more current data can contribute to better results through evidence-informed processes. Our work with the MazaoPlus project (part of our Data for Development Practice) has helped us, and our partners, better understand what needs to be done at scale in order to close the data access gap in the agricultural inputs market. One of the insights we have gathered is the need to find ways to empower agricultural extension officers in the public sector with easy-to-use tools and information to support smallholder decision making. Another key insight has been on the need to strengthen collaboration among the various key actors at the grassroots. Information asymmetry related to price, availability and application of inputs can create opportunities for predatory behaviour by rogue vendors and consequent depressed outputs and decreasing incomes.